Blogging has become so ubiquitous that the word ‘blog’ is often used interchangeably with ‘website’. Like Facebook and Twitter, blogging has entered the common consciousness and even has its own spin-offs like micro-blogging. Even your grandmother probably knows what blogging is! What a lot of people don’t know is how effectively blogging can be used to drive traffic to websites, forge long-term business relationships, and build brand loyalty. That’s right: a blog can be an excellent tool to help you grow your business. If you haven’t thought about blogging in that light before, it’s time to start. In this post, I’m going to talk about how to leverage your blogging skills to boost your business. The great blogs out there have highly talented writers behind them. In fact, the entire business of the internet revolves around the most basic and fundamental of skills: writing. Headlines. These should be powerfully crafted and demand to be clicked on. They are what ultimately will drive readership of your blog. If you’re stuck for inspiration, use one of the many blog title idea generators out there to generate something that’s catchy without being clickbait. Style. Know your voice and develop it to keep readers coming back to your blog. If you’re someone who tends to speak in a short and direct fashion, you should write that way too. In fact, in general when writing for the internet, steer clear of long, wordy phrases. Our attention spans are not the same as they once were. Keep it clean, clear and concise. Structure. Break up bulky paragraphs with pull quotes or visual content to increase the likelihood that people will actually read your blog posts from beginning to end. Make a point quickly and then move on – in another paragraph. Quality. Never publish a blog post without editing or proofreading it. Enough said. No excuses. Sloppy writing conveys a careless approach to business. Editing is an essential writing technique that far too few bloggers work at perfecting. Yes, it takes precious time. But it’s worth every second. You’ve been honing your writing skills and they have improved dramatically. Now it’s time to take them and apply them to areas of your business other than your blog. Many aspects of digital marketing rely heavily on writing. 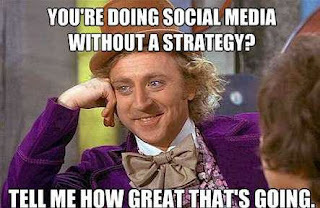 And the same pillars that make for a good blog post also make for a good social media strategy. Consider this: you have to be a smart, snappy writer to stay relevant and ‘liked’ on social media. Use the experience you’ve gained from blogging to craft tweets that read like a good headline. This is especially true for brands in non-viral markets. Case in point: Brickell Men’s Products. They sell men’s skincare products – not something that gets shared around social media very often. So they craft direct, creative social posts that appeal to their target customers. The same extends to email marketing. This is like the bread and butter of successful eCommerce businesses. Craft simple, direct headlines and paragraphs in every email template. It may help to think of each email as a mini blog post. It has to have a beginning, a middle and an end. Ideally it will also include a call to action – in this case, one that encourages the reader to click on an email link and make a purchase. Finally, collaborate with other writers! Reaching out to other bloggers is one of the best ways to grow your business as you can exchange guest posts, product reviews and customer referrals. Guest posts in particular lead to increased exposure for your brand and boosted traffic to your website. You don’t have to limit your guest blogging to your particular niche. Find blogs and influencers in markets adjacent to your own, then share insightful, top-quality content that’s been well-written and carefully edited. For example, if you sell cosmetics, you might try to collaborate with a fashion blogger. This kind of adjacent marketing presents a win-win situation: you get to promote your business, the blogger you work with gets freebies, and both of you gain new audiences and/or perspectives. It’s hard to do things alone. The writing skills you have honed through blogging are extremely valuable so don’t be shy about reaching out to people to further your business endeavors. Paid outreach tools like Buzzstream and Ninja Outreach can make finding bloggers to collaborate with easier, as well. Strong writing skills are the cornerstone of a good blog and they are equally essential to successful digital marketing campaigns. While blogging offers a great way to talk about your business, you can successfully use the skills you use when blogging to build business sales and boost conversion rates with a little creative thinking. I hope the above tips have helped you – do let me know in the comments below how you apply your blogging skills to spread awareness and boost sales! Guest Author: David Porter is Marketing Director for Brickell Men’s Products – high performing natural skincare & grooming products for men. Their products are sold in over 25 countries in high-end luxury department stores and spas. You can see their products in the pages of GQ, Men’s Health, Men’s Journal, and other major media nearly every month. The post How to Leverage Your Blogging Skills To Boost Your Business appeared first on Jeffbullas's Blog.